United Nations has declared 21st June as the International Yoga Day. It recognised that Yoga "provides a holistic approach to health and well-being" and that wider the dissemination of information about benefits of practising Yoga would be beneficial for the health of the world population. Yoga is a physical, mental and spiritual practice which integrates the body and the mind. "Yoga is an invaluable gift of India's ancient tradition. It embodies unity of mind and body; thought and action; restraint and fulfilment; harmony between man and nature; a holistic approach to health and well-being. It is not about exercise but to discover the sense of oneness within yourself, the world and the nature. By changing our lifestyle and creating consciousness, it can help us deal with climate change. 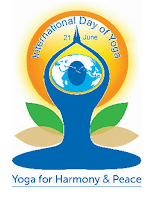 Let us work towards adopting an International Yoga Day." This will provide a plateform to people of all age groups who want to experience the meditativeness and expand their perception of life from individuality to universality. Yoga, an age old practice having its origin over 6000 years ago in India that has grown exponentially in recent times and is enjoying all over the world. Yoga is taught in many schools as well as individuals or groups in different parts of the world today. It is not a religion. It is a vast science of spirituality. The aim of yoga is to be a good human being and to be happy in life. So it is for everybody because everybody wants to be happy. Yoga is an invaluable gift of India’s ancient tradition. It embodies unity of body, mind, thought and work of life. It also restraints the fulfillment and harmony between the nature and human being. It is a holistic approach to health as well as well-being. It is not only exercise, but also uncover the sense of oneness within yourself, the nature and the world. It is good for changing our lifestyle and creating our consciousness. It can help us in many ways. Date : 21 June 2015 ; Time period- 35 min. देवाभागम् यथा पूर्वे, संजानाना उपासते ।।"
At the time of Meditation play melodies background music.